Hate to order online? Here are Snail Mail details. Author / illustrator Liz Miller self-published this popular third edition in March 2003 through Get Rolling Books. Photographs by Dan Kibler. What's inside? Read all about it. 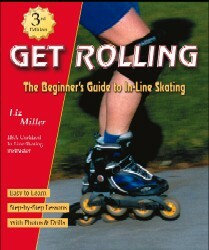 Get Rolling is also available at Amazon.com. Retailers, find information about quantity discounts for resale. Featuring Debbie Merrill, "instructor to the stars" and owner of Skate Great USA School of Skating. Please don't try this at home when you see Debbie figure skating without protective gear in the opening sequences. If she looks like a showgirl, that's because she is! Read more in Meet Debbie Merrill in the Get Rolling Orbit. Featuring Kristi Yamaguchi. In this short (8 1/2 minutes) video, Kristi shows beginners how to have fun and avoid injuries. Liz found this on a visit to the local AAA office, and was amazed to learn it is free, produced by the AAA Traffic Safety Department. No charge to get your own copy while they last! Half a dollar covers shipping materials. Just because the new and improved third edition has all the latest in skill development and resources doesn't mean Liz's original labor of love has lost all of its value. Great as a coloring book for a child, plus still-valid skating tips for you. This limited edition is also avaialble for free until supplies run out. Half a dollar covers shipping materials. Danville CA 94526 USA * International check or money order must be in US dollars drawn on a US bank.